Crispy baked tofu and roasted broccoli bow with a blood orange soy sauce. 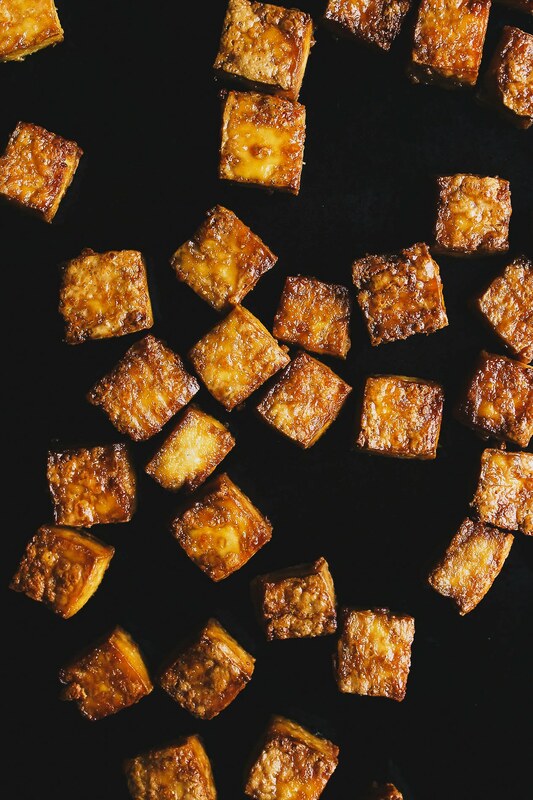 Crispy, lightly coated, naturally gluten-free, vegan baked tofu. Vegan, and natural gluten-free crispy baked tofu. are becoming more familiar with each day. And, I find comfort in that. And although I haven’t fully embraced the Midwest as my home yet, I’m starting to miss Philadelphia less and less. I guess that’s probably the first step to embracing this change. Right? Letting go of the past, or something like that. I still miss stepping out my door and walking to get a quick cup of coffee or noodle bowl. But I’m excited that in a few months, I’ll have a brand new list of favorites to hold dear. Standard hangs, cafes, secret picnic areas and quiet neighborhood getaways. 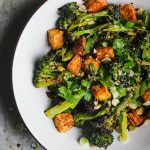 This crispy baked tofu broccoli bowl was inspired by one of my favorite joints and one of my favorite dishes in all of Philly. I found myself craving it for days. I don’t eat tofu all that often. Mostly because I tend to avoid soy in general. But when I do, I eat crispy baked tofu. And it wasn’t until recently when I took some clues from Kate that I perfected my baked tofu recipe. The trick is to toss the tofu in a little bit of cornstarch or arrowroot and then bake it extra long on each side to make it real super crispy. This post is sponsored by Winona Pure, a non-GMO cooking spray line that is free of chemical propellants, artificial additives, alcohol, silicone and soy. And unlike most sprays Winona Pure products are safe to spray directly onto your food. I’m giving away a Winona Pure sampler pack. To enter, check out their product line here and then drop me a comment below. I want to know which oil suits your fancy most. Contest closes on January 23rd at noon Central. One winner will be chosen at random and notified by email. This dish requires some planning ahead and prep time to prepare the tofu properly. Be sure to read through the instructions before you begin. Remove the tofu from its packaging and set it on a large dinner plate, then set a small plate on top of the tofu and weigh it down with something heavy, like a large can of tomatoes. Allow the tofu to sit 10 minutes and discard the liquid that has collected at the bottom, flip it over and repeat. The tofu is now pressed and prepped. Cut it into 1-inch cubes. In a large mixing bowl whisk together 1 tablespoon olive oil, 2 tablespoons tamari and garlic powder. Marinate the tofu in the mixture until all of the liquid is almost all absorbed, this should take just a few minutes. Sprinkle with cornstarch and toss lightly. Line two baking sheets with parchment paper and spray them lightly with the olive oil spray. Distribute the tofu on one and the broccoli on the other. 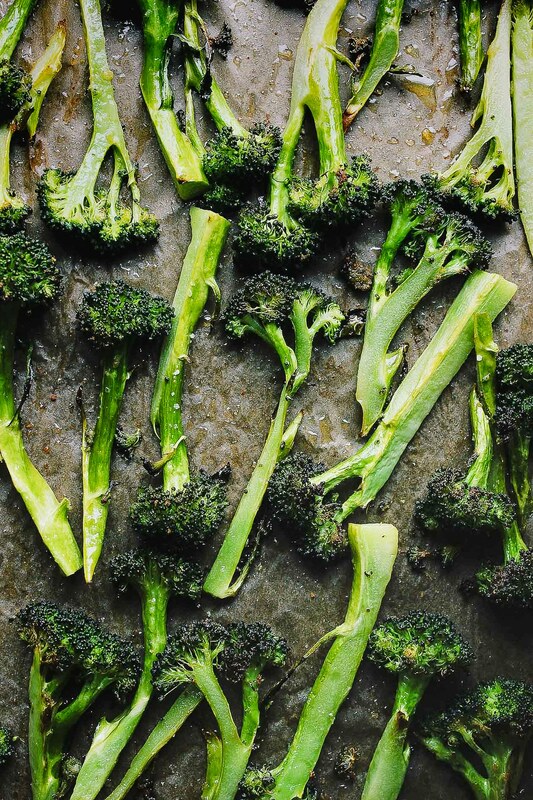 Sprinkle the broccoli with sea salt and a touch more olive oil. Pop them both in the oven, the tofu on the rack nearest the bottom and the broccoli on the top. Roast for 25 - 30 minutes, and flipping the tofu and broccoli halfway through. The tofu should be golden brown and crispy on both sides and the broccoli should be bright green and just starting to brown. Meanwhile whisk together the remaining 2 tablespoons olive oil, 1 tablespoon tamari, orange juice and sriracha. 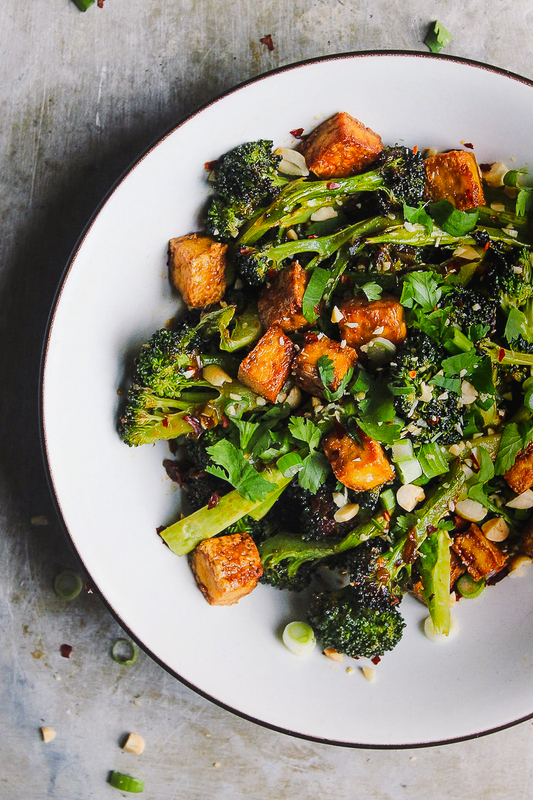 To assemble, divide the tofu and broccoli into bowls, drizzle on the blood orange sauce and top with green onions, peanuts and red pepper flakes and cilantro if you desire. This post is sponsored by Winona Pure; all opinions are my own. 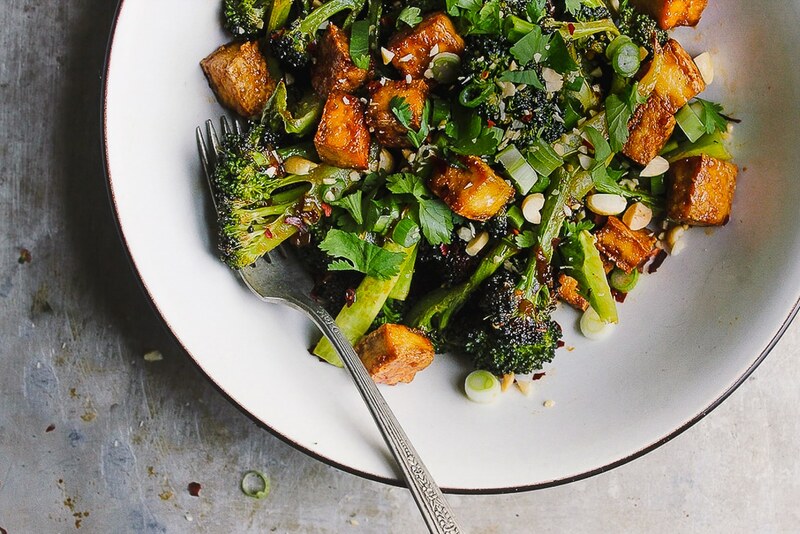 Looks like we were both craving Asian broccoli bowls with citrus soy sauces this week! Love it! This sounds delish. Hope adjusting to your new city keeps going well. I feel like I am still adjusting to Denver so I feel you! Its been three months and my heart has still ached for California at times. But overall you come to love your new space! Excited to hear more about St. Louis. Hope you have a cozy night in your new space and have fun recreating it to be your own this week! How exciting to learn about Winona Pure spray! How to choice just one…guess I would have to pick the olive oil spray. Can’t be without my olive oil! That bowl is beautiful! While I’m definitely intrigued by the popcorn spray (our old school popcorn maker is probably our most used kitchen tool) I would have to pick the olive oil spray. I hate to admit that I always have cooking spray around and would love to find a safe product that I can truly get behind. Who are you and where have been my whole life? Lol – I love your vegan options. Of course everything I’ve seen on your Pinterest board looks amazing. Glad I found you on Facebook too. Minimal residue that is safer and better for you? Count me in on the Winona Pure Spray! The cornstarch tofu trick is one of the best! I’m teaching a cooking class to a new vegan tomorrow, and that one is def on my list of what we’re going over. That bowl looks fantastic. Oh my gosh, this looks spectacular. Such beautiful photos, and that shot of the crispy baked tofu – heaven. I can only imagine how much you’ve got on your plate these days with unpacking and adjusting to a completely new city, completely new home (and light!) but knowing you, you’ve got this on lock and this stunning post just proves it! Thinking of you, friend! I’ve never tried baking tofu! I’ve added this recipe to my menu for the week- can’t wait to try it. And I’m excited to try the oil sprays. Olive Oil would get the most use in my kitchen. Soy is my junk food that I eat once in a while, but I have never tried baking it, oddly. This looks super delicious. I love your photos here! Definitely the popcorn butter! I always am using my misto to spray on olive oil but I feel like it doesn’t evenly distribute and it gets clogged trying to spray a big batch of popcorn for me an my bf. This looks like an awesome product! Also ahhhh your dang crispy tofu is genius, don’t know why I didn’t think of doing something like it before. I am definitely trying it this week! Thanks for all of amazing ideas! Crispy Tofu looks and sounds yummy. I am not a big fan of tofu but anything crispy I will give it a try. Thanks for inspiring me to try my hand at making this dish. Although I Love olive oil I am all over the popcorn butter spray. I only eat air popcorn and with my craving for butter on it. That sounds like a perfect healthy substitute for the melted butter. This looks so good. Roasted broccoli is one of my favorites, especially when I can make it into a meal. Thanks for introducing me to Winona Pure Oils. I too struggle to find a spray kind that I can get behind, but this company sounds like they’re on board! I would love to try the Sunflower Oil, as I would like to start using that kind of oil more. If I have to pick one, it would be the olive oil. But, I would take any one. Hello from Philly! Its cold and icy here, Im sure you dont miss that. I really like your photography, it’s very good! My favorite spray would probably be the olive oil spray. Thank you! Oh wow! Tofu crisp-roasted in the oven! No more frying – pure awesome! Can’t wait to try the Winona Pure spray. Thank you for this genius recipe. So glad to have stumbled upon your blog. I’ve been searching far and long for tasty vegan options! With each new passing day, the new becomes familiar. All the best to you on your new place. May it start to feel like home soon. We’d use the olive oil spray all the time. I have got to try the Sunflower Oil. These look great – nice to some some healthy options out there. I’d love to try the olive oil spray. And will definitely try the recipe – thanks! I have never tried tofu in my recipes, but I will be adding this to my recipes for this week. All I can say is yummy! This was soooo yummy and easy to make. Thank you! So glad you loved it Chanda! Wow this looks so delicious. I definitely have to try making it. Your photography is so beautiful, I love your blog! Hi! The crispy tofu in this was amazing (pre-covered in sauce), and O love the whole recipe idea. But the sauce just had way too much tamari in it! We could hardly eat it it was so salty (I took care not to add any other salt as I knew the tamari would be salty enough). Did you use salt-reduced tamari maybe? Or was the measurement supposed to be something different? Thanks! Hi Rebekah – thanks so much for your feedback, I really appreciate it! And I am so sorry, I just checked and it was low-sodium tamari. I will make a note of this in the ingredients and I sure hope you were able to salvage the meal. That’s okay! Thanks for the fast comment back. Great – that’s good to know for next time (will definitely be trying it again because the crispy tofu is so great!). Thanks again, Rebekah. I’ve never ever tried tofu before but this just might make me try it! I’ve moved almost entirely to olive oil, and have begun experimenting with coconut oil. Both the olive oil and coconut oil sprays would be in my basket in a heartbeat. And your broccoli/tofu bowl recipe will be on my table this week! Hi, I like the sunflower oil due to the higher smoke point as I roast veggies each week. My new love to roast is radishes.I’ve fed them to people who didn’t like radishes and they thought they were little red potatoes due to color and taste. Just love it. When you say to flip both trays halfway through, do you mean to switch the trays in the oven or to flip the tofu and broccoli? Also, for some reason, Sriracha gives me a stomach ache. Can I use hot sauce, instead? Would I use the same amount? Hi Susan – I mean to flip the tofu and broccoli on their own respective trays. You can simply omit the Sriracha or use whatever hot sauce you prefer. Hope this helps! We came here after reading about this in feedmephoebe.com, excellent dish Sherrie! We added some slightly fried haloumi on top. 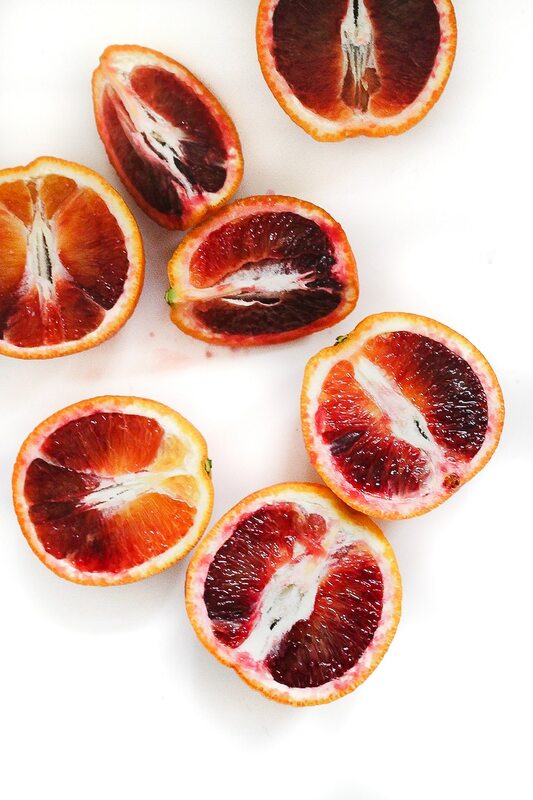 And we really loved what you did with the blood orange soy sauce! Excellent recipe. I’m so glad you liked the recipe + so glad you found me via Phoebe! She’s a gem.